This is how the Media Literacy Project(MLP) describes its mission: to “transform people into critical media consumers and engaged media justice advocates who deconstruct media, inform media policy, and create media that reflect their lived experience.” Andrea Quijada, Executive Director of MLP was invited to Honolulu recently by Hawaii People’s Fund (HPF) to conduct a workshop for youth and their mentors to build true media literacy–the kind that requires “looking beyond the frame” of the media message to examine its context. Created by Gigi Archibeque: this piece of art represents the vision of the Media Literacy Project in training people to deconstruct the messages with which they are bombarded daily. The workshop felt especially relevant as the discussions that took place at the recent Synod became public, first in a promising draft form, then in a more conservative final document stripped of some of the earlier expressions of change. The US bishops in recent times have expressed a desire to get better at messaging and marketing. I am not sure that’s where the problem lies–their messages are only too painfully clear. But perhaps they do need Quijada to conduct a similar workshop for them. Clearly context and the realities of lived experience matter less to many bishops than chapter and verse of church doctrine. Would they were as diligent about chapter and verse of the Gospels. The Synod raised so many hopes but ultimately also left many disappointed by the doggedness of the opposition of some bishops to Pope Francis’ more welcoming approach to divorced and LGBT Catholics. It is hard to fathom how the bishops were able to discuss family issues with so little representation from families in all their diversity. Clearly, despite all of the encouragement by Pope Francis to be a more welcoming church, to walk with people, to encounter people in the messiness of their lives, there was continuing resistance from some princes of the church to looking beyond the frame of their message. Had they done so, they might have found the real context of people’s lives, of the challenges women face, of the feelings of exclusion felt by LGBT Catholics even as they listen to homily after homily about how we are all God’s children. 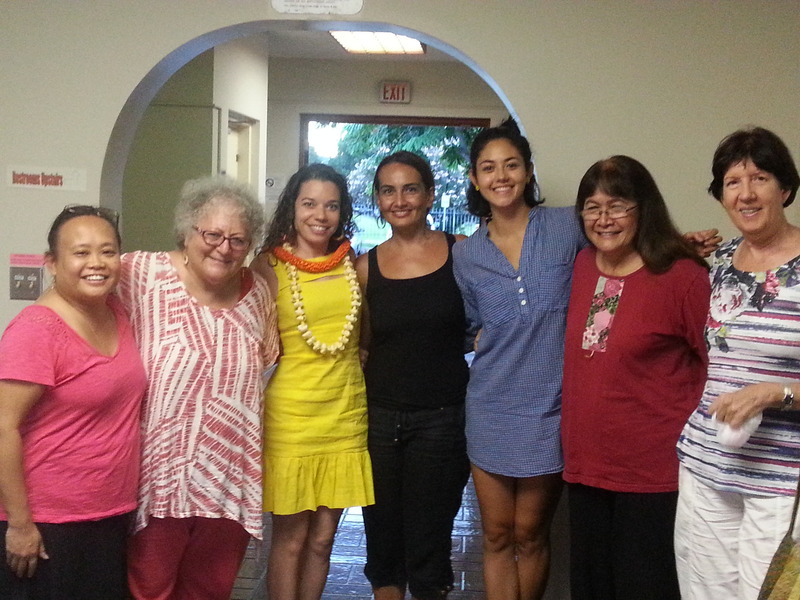 Andrea Quijada, (in yellow) ED of the Media Literacy Project based in Albuquerque, New Mexico is seen here with Nancy Aleck (second from left) and Darlene Rodrigues (far left) of Hawaii People’s Fund. HPF brought Quijada in to conduct a workshop for young people and their mentors. She engaged in a thoughtful discussion the night before the workshop with a small group that included (from extreme right) Barbara Polk, Evern Williams, Marika Emi and Vera Zambonelli. The enthusiastic response from both mentors and young students to Quijada’s Honolulu workshop reflects the growing desire for tools that will help cut through mis-information overload and get to the heart of issues. Vera Zambonelli is the founder and creative executive director of Hawai‘i Women in Filmmaking (HWF) which is supported by HPF. HWF encourages young women to explore and pursue careers in the field of filmmaking. Zambonelli found the workshop a very useful complement to the work she does to empower young women to find their voice and articulate their ideas. “Andrea showed the group how to talk back to the media by deconstructing what they deliver,” she said. “That is an important form of resistance,” she added. It’s the kind of resistance thoughtful Catholics who feel excluded, silenced or victimized by the Church need to engage in if we want to build a better church. It’s how we move towards greater literacy in our faith. ‹ A Happy Atheistic Deepavali (aka Diwali) to Each and Every One of You! Love the art piece and the message!